Since I brew according to the Reinheitsgebot, I have to carbonate the beer naturally, which means no force carbonation (unless the carbonation is recaptured from fermentation). It’s actually a very simple thing to do, and I have already wrote about its numerous benefits prior. I prefer to do this via spunding (or basically capping the fermenter as fermentation winds down). For this I dedicated some automation to it. Here I am going to lay out my scripting and automation for it. A whole bunch of math there! What does it mean? Basically it turns the spunding procedure into a dynamic automatic pressure release valve. But this isn’t a basic post, lets break it down! In the script language you have to declare values, I always do this at the top of the script, these values will come in to play later and you will understand. Here they are. Once all the values are declared. I can start to use these names (values) in the script. Here I declare a hard value for a set of the values I defined. That means that the default carbonation level will always be 2.5 vols, the default could be anything. I chose 2.5 as it is the one I use the most. Here you see the loop command, this means it will be going in an infinite loop, making the script fully dynamic to changing variables (temperature, carbonation level, etc). More on that later. Now we start to get into the nitty gritty of the math. I start with temperature. Temperature is a very important part of the carbonation process. The temperature of the beer not only determines the amount of co² needed, but it also determines how much co² is retained in the beer. The higher the temperature the more pressure is needed, and the less that is residual in the beer to start. These inline equations factor these two factors I talked about above. 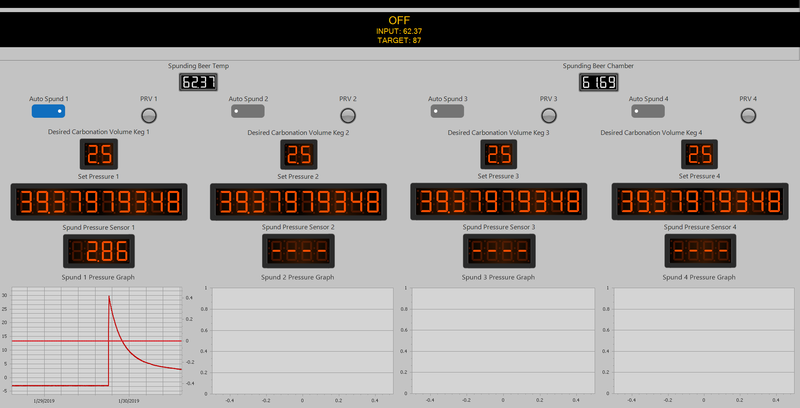 You can also see here that it uses some of the values we declared above, temp1,temp2, temp3. Next up is some more inline math, this is factoring in temperature of beer+ desired carbonation level. This sets the carbonation level (in volumes) to carbonate the beer. Since I have 4 pressure sensors like this, I can just repeat the same calculations 4 times. Since we now have our residual carbonation, plus our desired carbonation, now its time to start and set the pressure needed for that to happen. We do that here. We are subtracting residual carbonation, and adding the remaining needed. I can only do 1 inline math equation per line so that is why you see it this way. Again since we have 4 sensors this is repeated 4 times. The final carbonation equation is going to give us the real pressure in PSI needed for the proper carbonation level. This is finally going to allow the script to dynamically set the pressure to hold or release at. Now we get into some if statements. If statements wait until it sees a variable, then does something. It works like “IF” you see something happen, then “DO” this. “IF” you don’t see something happening (else) do this. So we can break this down. Thats really straight forward, above we have a slider tab that said “Auto Spund”. If that toggle is on (true in this case) then that is the signal that the script is the controller of the carbonation level. There is the “if” statement that sets off the chain reaction. Next we have another “if” statement. This one is for controlling the pressure release valve. 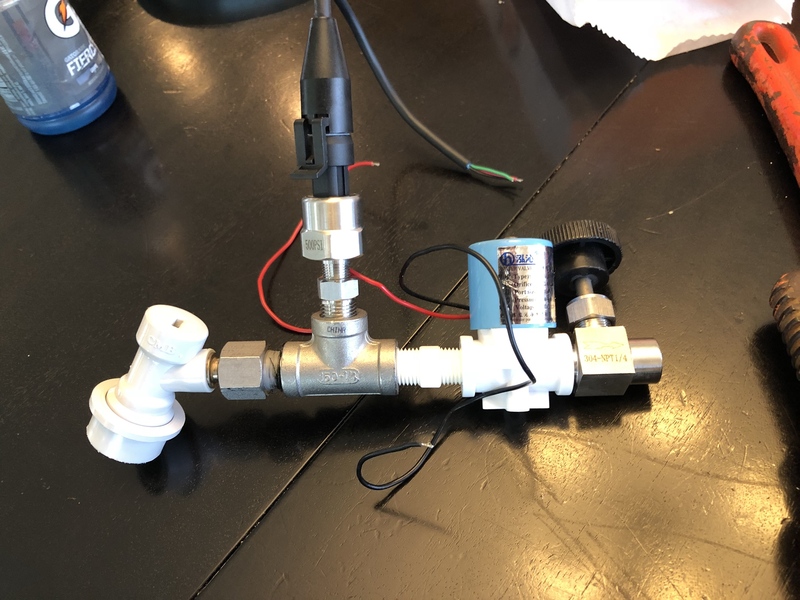 It says, if the pressure sensor that is connected to the spunding keg is > (above) the dynamically determined pressure for the carbonation level open the valve, if its not, keep it off (shut). Really straight forward. We now have some fail safes or alarming functions. These state, if the pressure sensor that is connected to the spunding keg is below 5psi or above 60psi activate an alarm, and email me with the issue. The else statement means if the “if” statement is not met, else is the status quo. So all is normal no alarms, if there is a problem with a high or low pressure, THEN alarm. Since there is 4 setups it is repeated 4 times. Lastly is the command that makes this dynamic. This means that it is going to execute the whole script listed above. It is going to sleep (or stop) for 3 seconds, then go directly back to the top of the script. This script follows that pattern indefinitely, therefore any change that happens, temperature change, pressure change, carbonation level change will be reflected and accounted for every 3 seconds. While it looks quite daunting to the lay person, this script was put together in a few hours. The benefit is having perfect carbonation levels, while being “hands off”. Here are some youtube videos detailing this. Hope this helps in detailing the scripting and automation of spunding for carbonation. It has carbonated a good number of beers for me and I couldn’t be happier.